The National Board of Catholic Women (NBCW) has published a revised 4th Edition of ‘A Guide to the Annulment Process’ supported by the Marriage and Family Life Office at the Bishops’ Conference of England and Wales. First published in 1998, the Guide seeks to de-mystify the annulment process, making it easier to understand, and hopefully less stressful. The 4th Edition also takes into account Mitis Iudex Dominus Iesus, ‘The Gentle Judge, our Lord Jesus, the Shepherd of Souls’, the document issued by Pope Francis in 2015 which gives a more streamlined and readily accessible way of proceeding in cases concerning the declaration of the nullity of a marriage. Printed versions of the new Guide are available to purchase from the National Board of Catholic Women priced at £5 including P&P. 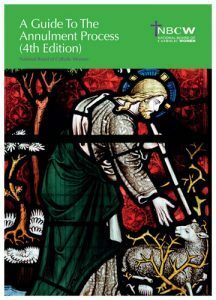 Please download an order form at www.nbcw.co.uk or www.catholicfamily.org.uk and email to: nbcwtreasurer@gmail.com. For interviews about the 4th Edition and the new procedures concerning the declaration of the nullity of a marriage, Rev Dr Brendan Killeen, Officialis of the Diocese of Northampton Tribunal, will be available for comment via telephone on Thursday 18 January 2018. He can be reached on (01604) 715635 (Bishops’ House) or (01604) 768483 (parish).